Are you tired of struggling while squeezing lemons with your bare hands? Well stress no more, because La Mexicana has the perfect soluction for you! Their cast aluminum squeezer is quite simple to use, light weight and mess free. Just place the lime inside and squeeze away to extract the amount you need. Once you try it you'll never want to squeeze a lemon with your hands again! Its an ideal tool to use squeezing and juicing any citrus fruit. Prepare and flavor your dishes and beverages with ease! Estas cansado de batallar al exprimir limones con tus propias manos? No batalles mas, porque La Mexicana tiene la solucion perfecta para ti! Su exprimidor de aluminio fundido es muy simple de usar, es de peso ligero y evita que ensucies. Solo coloca el limon dentro del exprimidor y exprime hasta sacar la cantidad que necesitas. Una vez que lo pruebues no querras volver a exprimir limones con tus manos jamas! Es la herramienta ideal para exprimir cualquier fruta citrica. Prepara y dale a sabor a tus platillos y bebidas favoritas con facilidad! Lost my exprimidor that I had for years, these are hard to find, as they are smaller and made for Key limes (as stated) and others larger are for Persian limes and oranges. Fast shipping and good price. ProsMade for Key limes (as stated) and it works beautifully. Others are too big and do not do the job. LOVE, LOVE, LOVE, THIS SQUEEZER! PURCHASED 5 LBS OF KEY LIMES AND IT WORKED PERFECTLY. 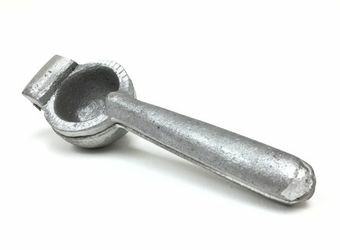 SUPER TOOL FOR EXTRACTING KEY LIMES. I was looking for a "key lime squeezer" and this is the exact item I wanted. This item is intended for KEY LIMES, which are small. Don't buy this squeezer if you are using regular limes, they will not fit. I make Key Lime pies and this is a great little tool to help speed up the process. The Key Limes fit in the juicer just perfectly and I get a good amount of extract. I highly recommend this tool if you need to extract juice out of Key Limes. 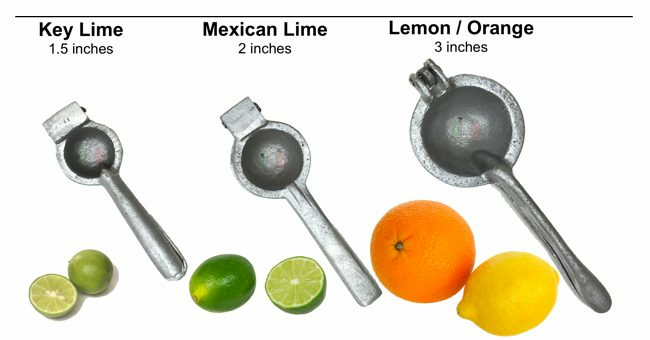 ConsMight be too small for use on regular (non Key Lime) limes. Looks authentic but too small for the limes we get at the local grocery store. It will serve its purpose I guess, but it really does need to be bigger around. ConsSize, sort of difficult to squeeze a lime of any size. If you're going to squeeze limes with this one, better opt for the smaller limes at the grocery store. The lime squuezer is very very small. The limes will not fit, unless you have very very small limes. No good at all for my purpose, wish the opening was slightly bigger. ConsEverything, no good for the purpose. I picked this one because I thought it looked authentic and charming but I was a little disappointed when I got it. It is very small and a little hard to get limes in there (it does work though). It would be perfect for key limes. Also, it does not open all the way to 180 degrees, which adds to the difficulty of getting a lime in there.